Launched on 7 March 2009 on a Delta II rocket, the Kepler space telescope is the result of a project that begun years before the first exoplanets were discovered. After the test period, on May 13, 2009 it began its science work, mainly as a planet hunter using the transit method, which means that it detected the tiny drop in a star’s brightness caused by a planet passing in front of it. 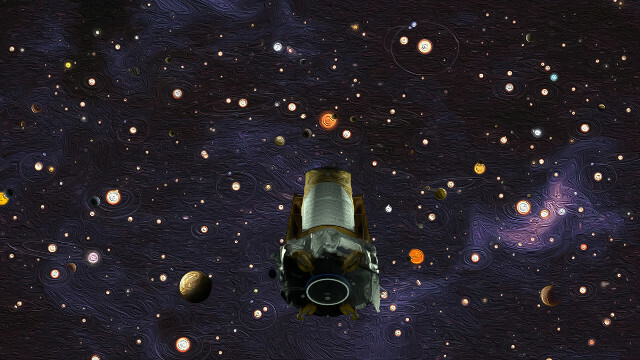 During its primary mission, the Kepler space telescope started finding exoplanet candidates in an area of sky that includes about 150,000 stars. Subsequently, the candidates were examined to verify that they weren’t false positives due to variations in star brightness not linked to the transit of planets. In 2012 the mission was extended, but problems started with its reaction wheels, the gyroscopic system that allows a high accuracy in Kepler’s aiming without using its thrusters. Three wheels were needed to maintain its attitude in order to have sufficient accuracy, but in 2012 and 2013 two of the four wheels failed. NASA’s engineers planned a new mission for the Kepler space telescope that would allow it to be used with two working reactions wheels and, after a test phase, in May 2014 the mission called K2 or “Second Light” was approved. With an accuracy close to the previous one, the K2 mission began extending its targets to a total of around 500,000 stars. The K2 mission was extended for three more years in 2016 with the prediction that it would be the final extension because thrusters would run out of fuel before 2019. The last Kepler space telescope’s observation campaigns were problematic precisely because the fuel was running out. On October 19, 2018, during one of the programmed connections between the Kepler space telescope and the Deep Space Network used by NASA to download the collected data, it was discovered that it had entered a sleep mode due to the lack of fuel. The 2,600 exoplanets discovered by the Kepler space telescope in the course of its missions represent only a part of an extraordinary legacy and a success that has gone beyond expectations revolutionizing the branch of astronomy dedicated to exoplanets. In fact, there are still almost 2,900 exoplanet candidates to examine and in the course of its missions Kepler collected information on the stars it observed that may be useful for other astronomical research. In short, Kepler’s data will be examined for many more years. On April 18, 2018 the TESS space telescope was launched, the heir to Kepler as NASA’s exoplanet hunter. Other instruments are also looking for exoplanets and various projects will bring further progress to this branch of astronomy but Kepler will remain a milestone in the search for strange, new worlds.